by Janice Christensen Photo by Zhana Vaynberg Nine Months: oversized screen printed birth control packs mounted on ceramic trays. Spendthrift: a purse made out of receipts. Just a Bunch of Old Bags: tiny cloth bags with pictures of notable women silkscreened on them. Two Wrongs Don’t Make a Right: wedding cake top bride and groom sitting in the bin of a diet scale. Love and Other Indoor Sports: a mattress of reaching yellow rubber gloves on springs, mounted on a bed frame. Strike Anywhere: oversized two-by-three-foot kitchen match box, slid open to reveal the bodies of women in aprons inside; a comment on abuse. That’s the kind of art Susan Buss used to create. “I guess I was fighting a lot of angst,” she reflects. “But I’m not in pain anymore – I kind of like my life. I do weaving now. “However, I’m trying to push that into more artistic grounds.” She points to an intricately woven rug on the dining room floor, diamond and cross patterns in blacks and deep reds. This is one of many projects Susan’s working on right now, both at her home weaving studio and at the Alice Bertschy Kadish Memorial Weaving Center. Since 2004, Susan has also been teaching classes at the ABK Center, located in the lower level of Gaenslen School, 1250 E. Burleigh St. The Center is a collaborative effort of Gaenslen, MPS Recreation Department, Wisconsin Handweavers Inc., the Studio Weavers and the Kadish Foundation. Not always on the teaching path, Susan pursued her education in fine arts. She attended UWM from 1995 to 2000, including a year in Nottingham, England. The attraction to England started when she was much younger. Susan grew up in rural Wisconsin. Her grandfather was a dairy farmer, and her mom and dad bought land from him and lived nearby. Susan worked on the farm for her grandfather when she was a teenager. When she was 16, a friend offered her a frequent flyer ticket to London. She took it. “I thought, ‘I’m never going to get out of here. I’m going to live in Delavan the rest of my life.’ So I went to England.” Little did she know that she would meet the man she was going to marry four years later. She lived and studied in England for a year, 1997-98, then “traveled back and forth a lot. In England, we went to lots of art museums.” She also cultivated her taste for fabrics and stitchery. During that time she created Dear Diary, a 15-foot piece with strips of dyed fabric stitched together and embroidered with words and sentences. “I would take my hoop and thread on the plane and stitch what I was thinking,” she remembered. But the marriage fell on hard times when her husband lost his job, and they were divorced in 2002. Susan moved back to the farm to “get my bearings.” She worked as a seasonal waitress in Lake Geneva, then on her grandfather’s farm. “I was 25 years old and getting paid $5 an hour to shovel manure,” Susan grinned. Evidently that clarified something for her, because she decided to return to UWM to get certification for art education. She had considered graduate school. “I had looked at Taliesin to study architecture. Frank Lloyd Wright was into organic movement of architecture; he used fabric and all aspects of art in his buildings. I would have gone to school in Spring Green during the summer, then winter in Arizona. I was also looking at Arizona State in Tempe – they have a good fiber program. But when it came down to it I wasn’t ready to move so far from my family. And the fact that you couldn’t drink the water freaked me out. Why would anyone live in the middle of the desert?” So she moved back to Milwaukee to get certified to teach art. “That was always the goal – if not grad school, then teacher certification. I always wanted to concentrate on a specific art form, then get certified to teach. I thought it was important to know what I’m talking about. It seemed like with just art education, you learn a little about a lot, and don’t get a chance to concentrate. I wanted to become an artist before I tried to teach it.” While in the program, Susan was invited to create an art show at Gaslight Building. The show title was “Testable Tubes,” and consisted of test tubes suspended from the wall, filled with ribbons stitched with phrases that people use when they are “testing out a relationship.” Phrases like, “How are you feeling?” and “Is there something I can do for you?” and “Can I hug you?” The test tubes reflected the testing in her own life at that time, because she had just someone who would be very important in her life very soon – Bob Buss. They were testing out a relationship that looked like it just might last. Now it’s five years and three kids later, and Susan Buss is happy with her life. “Arwen is 5, Adeline is 3, and Levi is six months old. She and Bob own a house on Clarke Street, and have beautiful gardens everywhere. “People call us a farmstead in the city,” Susan says. “Our plot looks like something out of the country. Bob and I grow gardens – on our lot and across the street at the Clarke Food Garden. I grew up on a farm, and Bob has a good appreciation for the farming lifestyle.” You can see Susan’s woven art work, as well as displays from other artists at ABK Weaving Center as part of Art Walk on Oct. 3 and 4. “We’ll have the Art Walk display at our house (823 E Clarke St). We’ll have a display on clotheslines in the back yard, and looms out for people to try.” This is going to be a “shine only” event. “We really don’t have space inside, so we’re counting on no rain!” And if you get inspired to take up weaving yourself, don’t hold back. The ABK Weaving Center has classes for all ages. They plan to expand their offering this winter with a parent-child class on Saturdays and expanded times. There are other fiber arts classes as well, like knitting, dyeing and basketry. Susan also teaches a color workshop. Check out the Riverwest weaving scene this year on Art Walk weekend. And that spectacular rug that Susan wove will be on display at the Jazz Gallery, 926 E Center St. Don’t miss it! 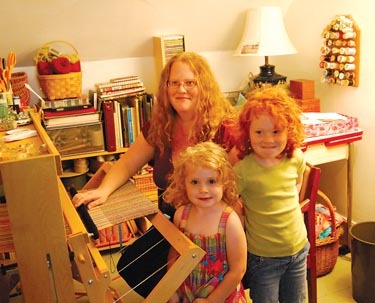 Photo: Susan at the loom with (clockwise) daughters Arwen and Adeline.